I'm just getting around to thinking about my garden this year. I'm a late gardener - putting in my garden in mid-June. 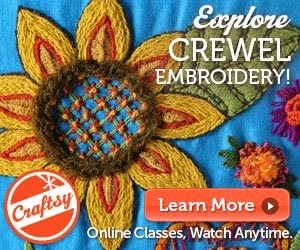 I thought some of you might be interested in planting sunflowers in your garden this year. 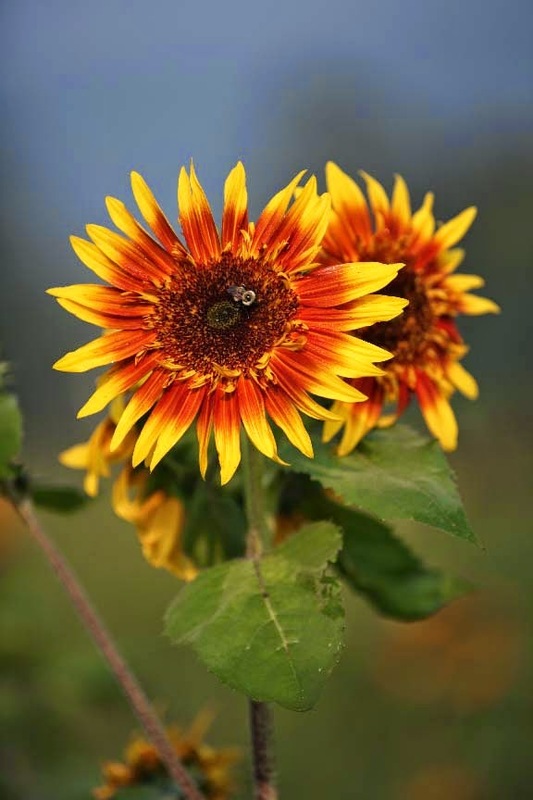 I am sharing this Sunflower Garden Planting Guide for any of you interested in growing sunflowers in your garden. It was originally posted in April of 2015 but all of the information is still accurate. Enjoy all you sunflower lovers and growers! I can't wait to see these pretty blooms again in late August. If you have followed me for any length of time, you know I grow sunflowers every summer. I heard from Melissa, a childhood friend of mine who follows my blog. She asked for a list of my favorite varieties of sunflowers. 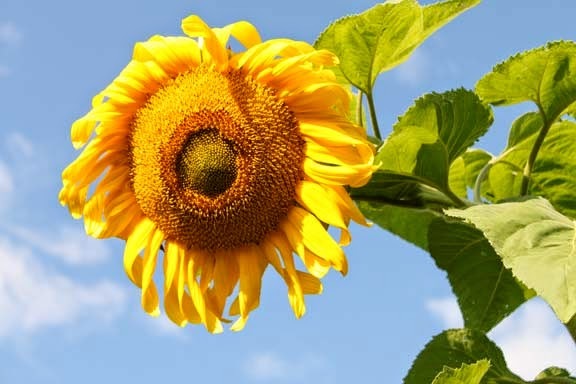 I think there may be more of you out there who might like to plant sunflowers this summer so I put this Sunflower Growing Guide together for all of my readers. Please share this post with your fellow gardening friends! FYI - I grow in western Massachusetts. All photos by me taken either at our Farmhouse Garden or at our Sunflower Field (from a few years ago). First off - there are two companies I buy seeds from. My longtime supplier has been Johnny's Selected Seeds in Maine. They ship amazingly quickly from Maine. No minimums and they have some mixed variety packs for those of you with small gardens. 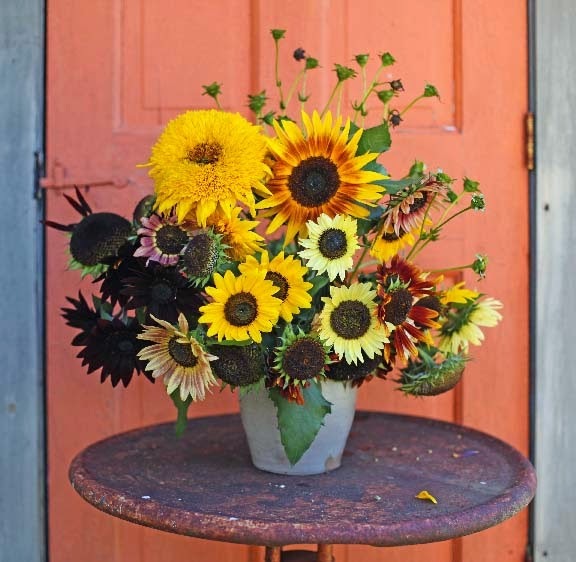 My second supplier (a recent find) is SunflowerSelections in California. I heard about them through this NY Times article. I have purchased from them since 2012 and have nothing but good things to say about the company, service and the varieties they offer. 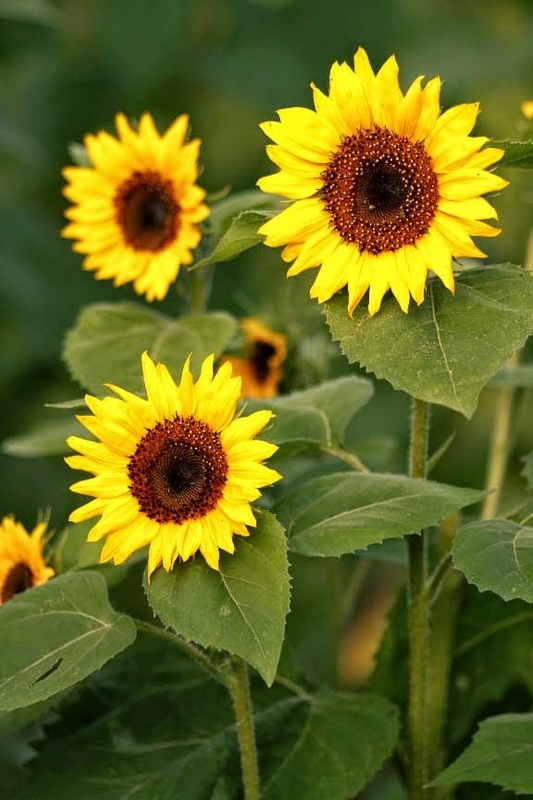 SunflowerSelections is actually a subsidiary of NuFlowers, a breeder of sunflower varieties. The only downfall is their packs are 100 seeds and there is a $15.00 minimum. Their website is set up to sort by colors, branching, single stem, and more. So here are some of my thoughts about growing sunflowers. This is what I have learned from many years of growing them. 1.You need sun! Shade doesn't work for them and long days of sun will yield much better flowers. 2. Although you can plant sunflowers early in the season, I wait until the middle to end of June to plant. This will give me flowers through frost. I have planted as late as the beginning of August and still gotten flowers - they are smaller because of the shortening days at that time of year. 3. 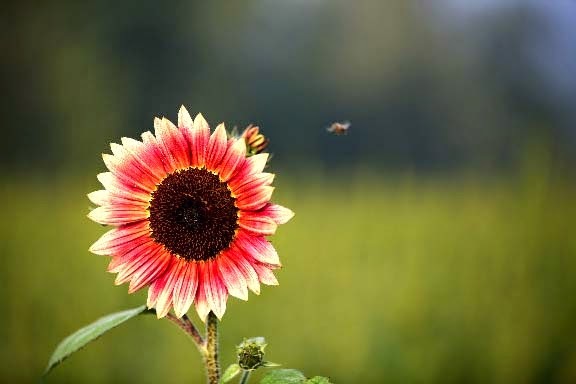 There are two kinds of sunflowers - Branching (many flowers per plant) and Single Stem (one flower per plant). 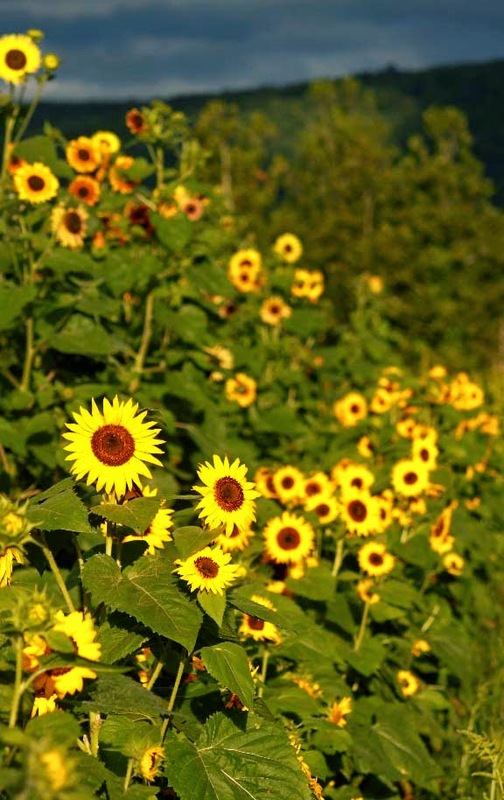 I prefer the branching sunflowers to the single varieties (ProCut, Sunbright, and Sunrich strains). You get more sunflower blossoms per seed and they have a wild and unruly appearance which really appeals to me. 4. Florists and growers usually plant the single varieties because they are reliable, are sturdy, and ship well. For the home gardener (me) they are a bit of a disappointment because they take up room and I only get one flower per stem. That said - they are very quick to bloom so I usually plant some so I get flowers quickly. 5. Once my plants are about 8 inches tall, I mulch the heck out of them to hold the water in the soil and keep the weeds down. Once they get going, they grow like crazy and shade out most of the weeds. 6. I don't fertilize my sunflowers. I have basic garden soil and the mulch from the previous year gets tilled in. I do add manure from my chickens and the sheep though every other year or so. 7. Don't crowd the sunflowers. If you do, they will be stunted and not thrive. I plant about 2 to 3 seeds every 12" or so. That gives me insurance in case the birds or mice eat the seeds. 8. Sunflowers tend to not transplant well. Plant them where you want them and be patient. They will grow as long as they have sun. 9. There are dwarf varieties of sunflowers available but I don't grow them. I did once and they just didn't seem right. I am fortunate to have lots of sun and space but if you are tight on space, check out these selections via SunflowerSelections. 10. 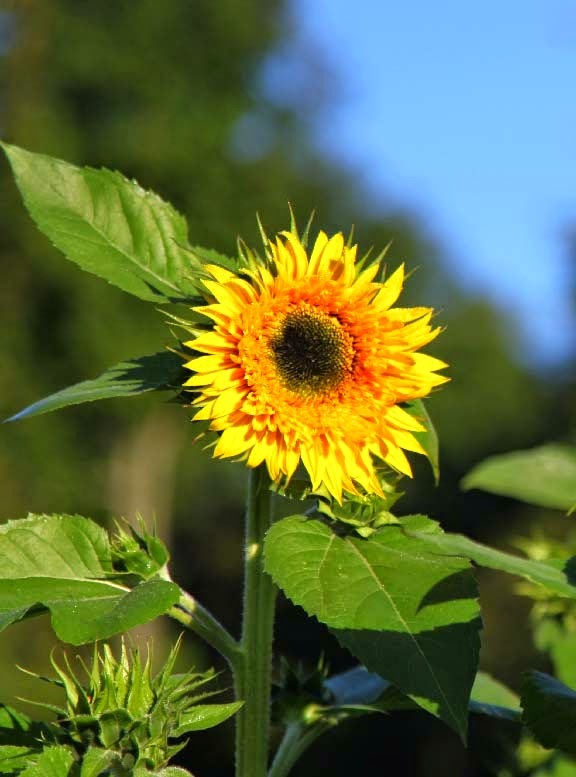 Most of the branching sunflowers have one very large top flower. If you pinch (or harvest) the top flower, the lower branches will grow longer stems and the flowers will be bigger. 11. If you are looking to grow the giant sunflowers for bird seed, I do suggest you plant them as early as possible. They need a long time to grow huge and win any contests. If you plant them later, they will be shorter and the heads will be smaller. I like the variety called Mammoth Russian available from Burpee. Here are the Sunflower varieties I highly recommend with links to each supplier who stocks the seeds. I have described why I enjoy each of the varieties. Don't wait to order your seeds because they often run out of popular varieties. The variety is BELOW each photo. Autumn Beauty - Branching. This sunflower is long season and needs a while to bloom. It gets very tall. Order seeds early as they are often sold out. This is Mark's favorite sunflower. The plants get huge and send out tons and tons of flowers. 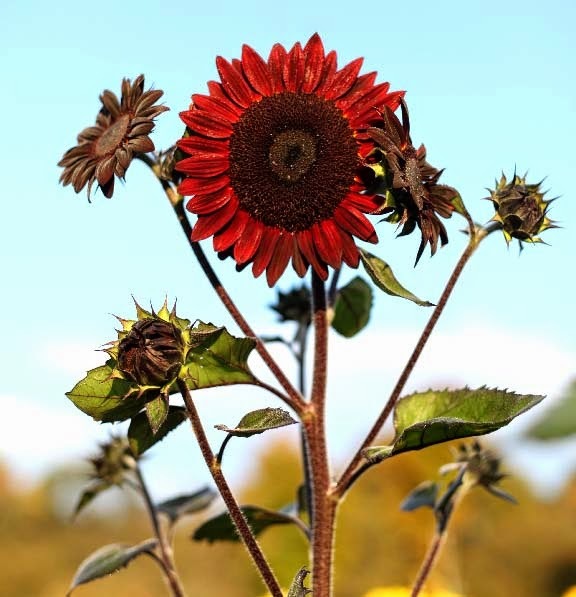 There is a wide range of colors - light yellow, light yellow with pink tinged centers, dark brown, rust, red, maroon, bronze, and classic sunflower yellow. If we had to choose one sunflower to grow, this would probably be it because you get such a variety of colors. Has pollen for those averse to it. Joker - Branching. I love this multi-colored sunflower. It is one of the first to bloom. The center is edged with a fringe of teeny petals. The outer petals are long. Once in a while, there will be a plant that has different looking blooms on each branch. It lasts a long time in a vase and is quite sturdy. Not too tall but definitely not short. Orange Ruffles - Branching. This sunflower was new to me last year and it rocked! 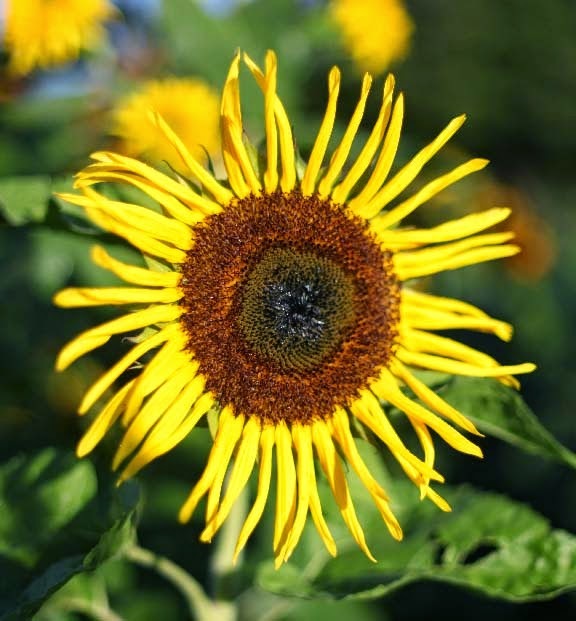 Similar to The Joker and Greenburst, it has a brown center with a fringe of mini yellow petals. Seriously gorgeous. Greenburst - Branching. This sunflower was new to me last year and I am in love! Reminiscent of Sungold, it has a tight chartreuse center surrounded by hundreds of tiny petals. The outer edge of the flower has slim long petals. The top bloom is big (8") if you let it grow. If you cut it off early, the smaller lower branches will produce bigger pretty (although smaller) blooms. Long vase life. 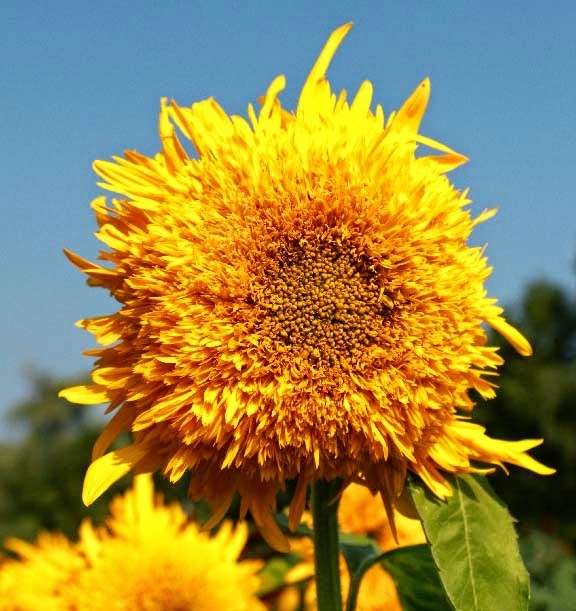 Sunbright - A single stem variety that is the classic sunflower. Quick to bloom. I always plant these so I have big blooms quickly. This variety is often grown commercially as is the Pro-Cut varieties which I am not highlighting here in this Planting Guide. 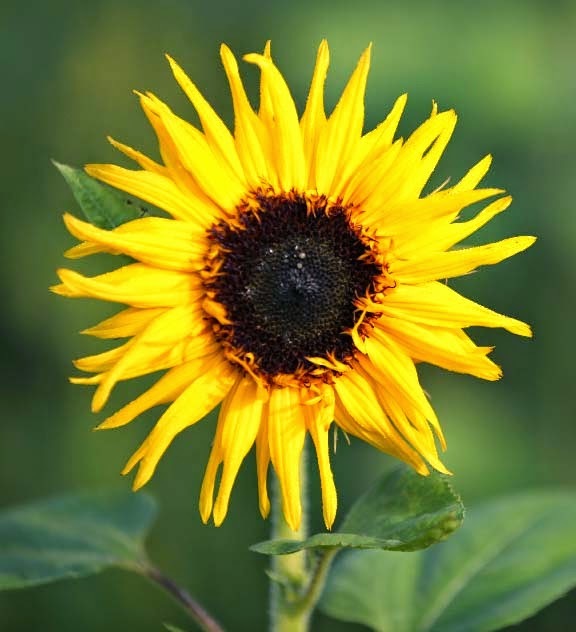 American Giant - This is the classic GIANT sunflower. One giant head per stem. These plants are like small trees by the end of the season. It is best to give them lots and lots of room to grow. They will shade out other plants so if you have a spot, away from your regular garden that has good sun - plant a few there for fun. You will have a giant seed head to feed to the birds. You could also plant a "sunflower house" for your kids and grandkids. Sungold - Branching. 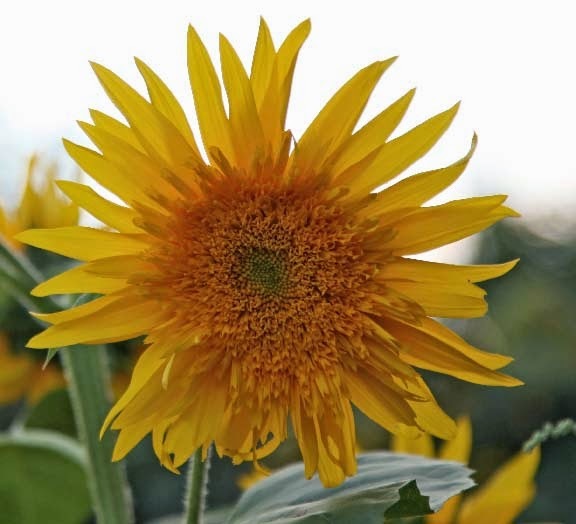 You need to have a long growing season for this gorgeous, puffy sunflower. They are always the last to bloom in my garden and I usually plant them first! The top flower will be the largest. Once you cut the top flower (usually 10" across) with its short stem, the lower flowers will grow with longer stems. A few years, the frost got mine before they bloomed, so plant them first! Holiday - I love this sunflower for its vigorous nature. You will get so many blooms off each plant. The blooms are not very big - about 5" or so. It does drop a lot of pollen (for those of you who are clean freaks). The blooms develop in the vase nicely. Golden Cheer - Branching. This variety was new to me last year. It is similar to Greenburst with a larger green center. It has a frilly textured edge to the center. Gorgeous. I plan on growing it again this year. Stella Gold - Single. 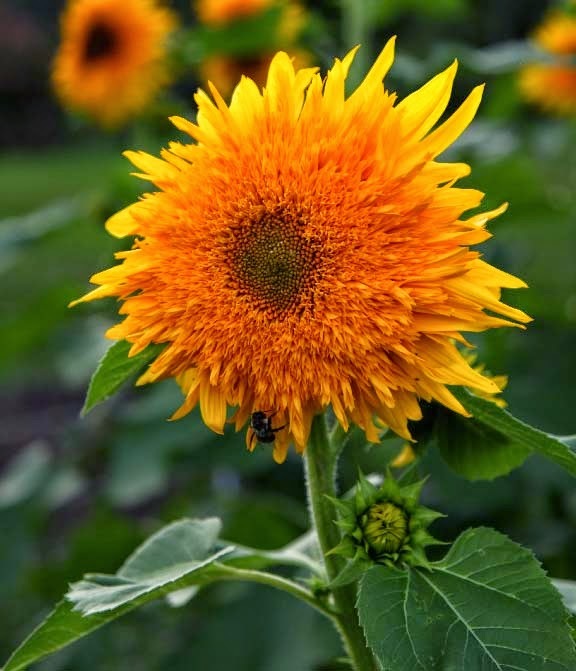 This is a quick growing sunflower with extremely long petals. I grew it for many years and then couldn't find the source of seeds until I discovered SunflowerSelections. Funny thing is years ago when I grew it, the centers were rather mis-shapen - almost oval in shape. I loved that. The seeds from SS are a bit more perfect. I miss the wonkiness but love the very long spider like petals. Above is a mixed bouquet from last summer. Flowers included are: Autumn Beauty, Moulin Rouge, Greenburst. I like mixing in some of the over mature "done" sunflowers for interest. I hope you will try to grow some sunflowers this summer in your garden or along the edge of your yard. Quite informative! And great pics too! However, WHICH ones have the best EDIBLE SEEDS..? Your sunflowers are inspirational! We are about to plant here in Northumberland in the UK...so glad of the advice. if ours are just a teeny weeny bit as beautiful and splendid as yours I will be thrilled. Thank you! I will order mine today! Your photos over the years inspired me to plant my own sunflower garden and have given me and the birds in my small yard much pleasure. Thanks for this post. I'll be sure to look for some of these varieties for this year's garden. 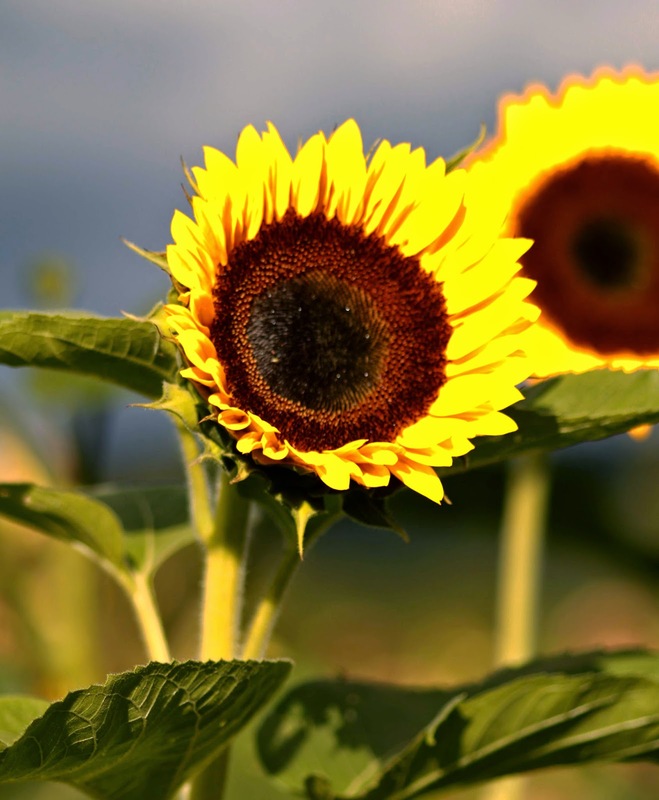 Thanks for such a great post about sunflowers. I have a fence that will need some hiding and sunflowers will do the job. Such happy smiling summer faces! Thanks so much Kristin, this is exactly what I was hoping for. 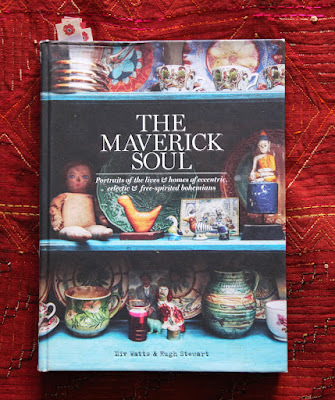 Your photos are just fantastic and the tips will be invaluable! Beautiful!! Thanks for the info. So happy to read this - my first year with a huge garden! I'll definitely be planting lots of sunflowers! Thank you! Thanks for all the good information. I put in ab order to Johnny's this morning. Can't wait to see what I end up with. 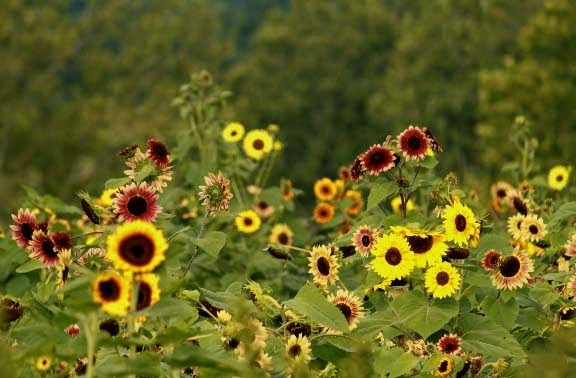 Love Johnny Seeds .The sunflowers are just gorgeous.Bright and colorful . ~ Sunflower Gardens ~ splendid !! Thank you for all the great info. I've planted sunflowers for years, but have to downsize my ideas this year. At least I can still have some flowers in large pots and will add nasturtiums and morning glories to the mix, so I'll have a nice combination of colors. 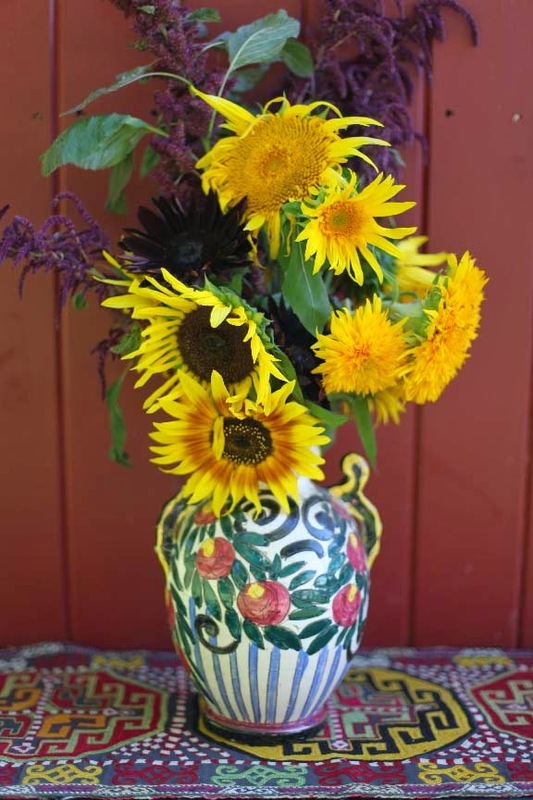 The coral painted door behind the sunflowers is lovely. Thank you for such lovely posts! I was wondering if you could offer me some advice at to which variety of sunflower seeds I should buy for a very particular sowing. I will be getting married in the South of France next year, and my dream is to have the ceremony in the middle of a sunflower field. I have even found a beautiful castle venue with a large property that is willing to plant a field of sunflowers for me! I am looking for a big, pollen-free flower, preferably yellow, that would grow between 4 and 6 ft tall. If you google sunflower fields, there are some that are a sea of yellow, and some that are mostly green with some yellow dots. I'd like the field to look as yellow as possible, so I don't know what variety wujld achieve that effect... I don't know whether a single stem or branching sunflower variety would be best...? What do you think? And which type could be planted early enough to be in bloom for our late July wedding?